Remember how I failed to identify the botanical object in the Cold Storage Logo as an apple? Yeah. Well, here’s another object I misidentified. 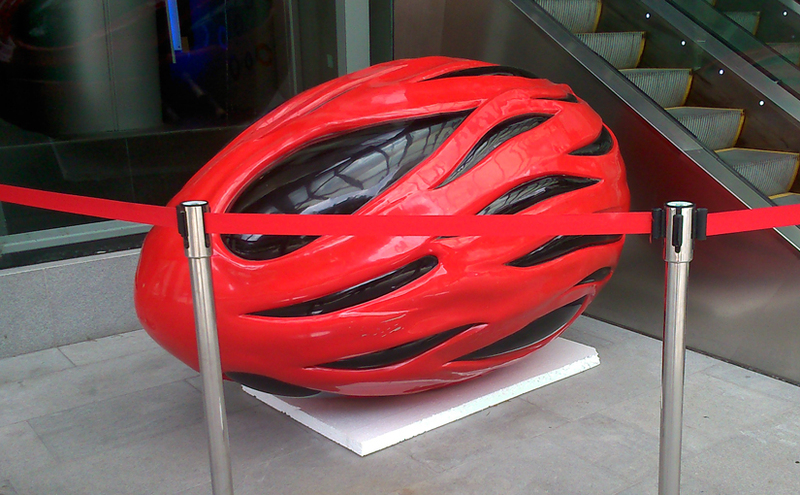 I more or less assumed it was a postmodern take on the aerodynamic bicycle helmet. Look at this actual bicycle helmet and tell me you don’t see the resemblance. But no, that giant sculpture by the escalator is a nutmeg seed. Nutmeg. And apparently the red stuff is called mace. Well, maybe people who grew up in this part of the world would be more likely to recognize nutmeg than I would, since the spice islands of Indonesia are not too far from here. If not, the fact that nutmeg trees are local at least explains this particular art installation at Orchard Road.